It was a roller-coaster year for investors in the clinical-stage biotech. Here's a review of the year's key headlines that caused shares to drop. 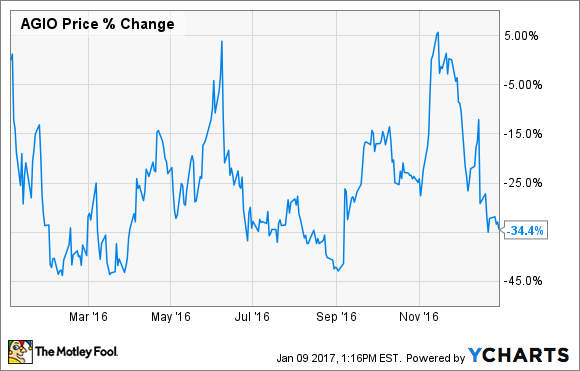 Investors in Agios Pharmaceuticals (NASDAQ:AGIO), a company focused on metabolic disorders, had a wild ride in 2016. The company's stock traded erratically all year long based on the headlines of the day, but it ultimately lost more than a third of its value during the year, according to data from S&P Global Market Intelligence. In March, Agios initiated a phase 1/2 study of AG-221 or AG-120 in combination with Celgene's (NASDAQ:CELG) Vidaza as a hopeful treatment for acute myeloid leukemia. In May, Agios and Celgene announced a new collaboration agreement that provided Agios with a $200 million upfront payment and the chance to earn hundreds of millions more if certain milestones are reached. In September, Agios raised approximately $173 million through a secondary offering. Combined with the collaboration revenue received from Celgene, Agios' cash balance at the end of the year stood at $574 million. In October, Celgene and Agios announced that they had entered into collaboration agreements with Abbott, to develop and commercialize diagnostic tests on its m2000 RealTime System to help identify mutations in patients with acute myeloid leukemia. In December, shares took a dive after Agios presented data at the American Society of Hematology meeting on its two pyruvate kinase (PK) deficiency drugs -- AG-348 and AG-519 -- that failed to impress investors. Later that month, shares fell by another 20% after Agios announced it had decided to stop development of AG-519, in response to a clinical hold that was ordered by the FDA over safety concerns. Agios and Celgene recently announced that they successfully submitted enasidenib (AG-221) for FDA approval. They also announced their intentions to have AG-120 in regulators' hands before the end of 2017, which means that Agios is one step closer to finally becoming a commercial-stage organization. With a balance sheet that is flush with cash and a strong partner like Celgene on its side, Agios and its investors have plenty of reasons to believe it will be able to bounce back strongly from the drubbing that it took in 2016.